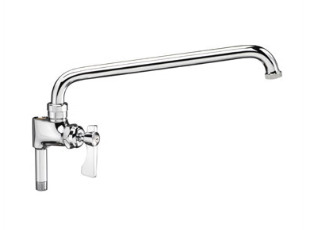 Add-On Faucet with 12 inch spout from Krowne allows you to use faucet with existing pre-rinse assembly. Interchangeable with T&S Brass and Encore fixtures. New style allows knob to be easily turned on and off without obstruction. 3/8" NPT male inlet and female outlet. Low-Lead compliant model, meets California AB-1953 and Vermont S152 standards.